Windows Explorer seems to suit your needs when you first start using it, but after a while you begin to wonder if there's a better alternative to having all of those open folder windows all over your desktop. XYplorer is a game changer. 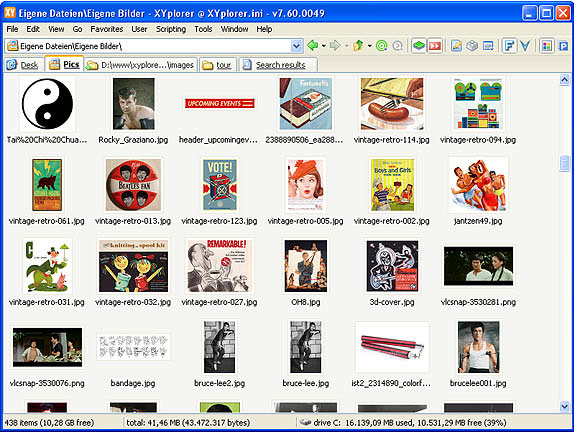 XYplorer is a file manager for Windows that offers a multi-tabbed interface, powerful file search abilities, flexible file preview capability, and the ability to automate frequently recurring file management tasks. And, unlike those heavy-footprint Microsoft implementations, XYplorer is fully portable - it doesn't require installation, and makes no changes to your Windows registry! You can even run it off of a USB flash drive! Let's talk about tabs. You use them all the time in your web browsing, so why not use them for file management too? Because until now, you couldn't, that's why! XYplorer keeps all of your open folders conveniently arranged in tabs, and even remembers open tabs between sessions. Keep your favorite files and folders color coded in the Favorites panel. 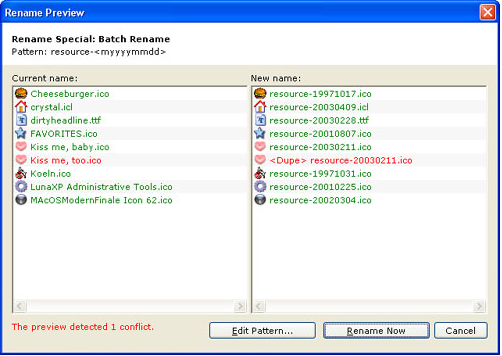 Rename batches of files with a single click. View images as thumbnails and easily reveal all details about an MP3 file with a simple mouseover. Perform highly sophisticated searches using Boolean logic and regular expressions. And how many times have you wanted to save and print out the contents of a Windows folder? With XYplorer, you can export extended file information to an Excel spreadsheet! XYplorer does not rest on its laurels, and is constantly being updated. The latest and greatest version features a new Address Bar Deluxe that rocks Unicode support, autocomplete for paths and files, and tab navigation through open items. Combined with even faster performance, color coding for file types, and improved scripting, there's no better time than the present to dive into XYplorer! Manage your Windows files and folders using an efficient multi-tabbed interface. View detailed preview information about any file with a single click. Perform sophisticated file searches using Boolean logic and regular expressions. Easily craft custom scripts to execute complicated tasks in a click or two. Export folder contents to Excel spreadsheets. Use the Favorites panel to sort and organize your frequently used files and folders by color coding. 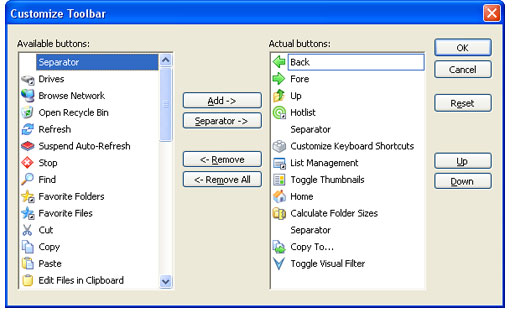 Fully customize the look and feel of XYplorer. “Robust features and extremely fast. I have used this portable software daily (9 to 10 hours a day) for approximately one year. I truly believe this is my most useful software on the windows platform. “XYplorer is not about any one particular feature; it's about how all those little parts come together to form a cohesive application. Days, weeks, months after you install this gem you will notice those little treats that will make you smile, and say to yourself, "Mmmm, Nice." Anyone who has used this app for any length of time will see that every feature was carefully considered before it was added. Just USE it. You will love it! “Let's face it, I'm a hopeless techno-junkie. My latest fix, "XYplorer" is the cleverest file management program I have ever encountered and I've been vetting software for quite a few years. Having used several file managers, including dual pane, I was blown away by XYplorer's tabbed interface. This makes flicking between several drive partitions and file groups unbelievably quick and easy. The multitudinous things this user-friendly program can do continually amaze me but are far too numerous to go into here. It's even more astounding when you realise how small a footprint XYplorer leaves on your hard drive. It does not even have to be installed. “XYplorer is perfect for an admin like myself to take with them on an USB memory stick when helping users logged in as users or power users without having to mess around re-authenticating all the time, since they can do a RunAs on XYplorer directly and authenticate just once to then browse to many servers without the need to log the user off and on as them and without constantly being prompted over and over again for credentials, etc. Windows Explorer does not work well with RunAs. There is a trick of using Internet Explorer instead to get around this, however, this no longer works with Internet Explorer 7. “I recently downloaded the trial version of XYplorer and am really impressed! I'm usually one to support open source communities by using and contributing to their software, as I am a software engineer by trade. Yet, there appears to be no open source project that I am happy with for file management on Windows PCs. I am usually very picky about applications' GUIs. As a software engineer, very few applications satisfy my high expectations of both visual aesthetics and usability. Then I found XYplorer. Everything I want to do with file management is included in XYplorer. Nothing is out of place; everything is so easy to find, even information in the help files. "I quickly found what I was looking for with your "Backup" option to act as a Copy w/ 'no to all' option that File Explorer and Windows Explorer lacks. I instantly transferred over new and newer version files from one folder on one drive to a duplicate folder on another drive. It found 2 newer versions and a dozen new files out of 16GB of 58,000 files. Wow. It would have taken me days to sort through my files and file the new ones. I might have even missed the new versions all together on my own. Jon Young Is the XYplorer lifetime license also get 51% off? El Don No, this offer is for the standard license. Luc Larsen This is a great file manager. But try it before buying. It does not have a dual pane option (yet?) - the type of user interface most people expect from a file manager. El Don Dual pane is in fact planned for version 8.00, which is fully covered by the license offered here (it includes all upgrades up to and including 8.70). Stop Spam Could you please consider offering a discount for the lifetime license also? Donald Lessau The lifetime license is already a huge discount in itself. I don't plan to offer a discount on top of this. The standard license does never expire, and includes upgrades up to 8.70. If you want to use 8.80 you indeed need to purchase another standard license. Albert M Does the standard licesne include advanced features like scripting? Donald Lessau Yes, the Standard License covers all features! The only difference to the Lifetime License is the number of free future upgrades. The Standard License gives you 9 free upgrades, the Lifetime License unlimited free upgrades. Jose Luis Is multilanguage support available (officially or unofficially) or going to be available in a near future? Donald Lessau The "Tips of the Day" support any language (user-provided). Interface, help file, xywiki, and web site currently support only English, and it will probably stay at that for the near future. Scott User Fantastic! I downloaded the trial version and played with it for 15 minutes. Then I knew, this was the File Management tool I have been looking for. There is going to be a bit of a learning curve as this program has so many useful features. Awesome deal, thanks! I use XYPlorer pretty much every day. I adore it's search feature, by the way - can't live without it anymore. But anyway: XYPlorer saved my sanity when I moved from XP to Vista. I wrote my friends that I felt like I had found an old friend to help guide me in a very strange new world that I was a bit lost in. I have Dopus, I have well, lots of Explorer replacement programs, but I like and use XYPlorer. And the developer is AWESOME to work with...along with all the rest of the users over at his forum. I wish all developers were like him. He is a pleasure to witness! Check out his group of likewise adoring followers. PS: I know nothing about Script. I manage to use XYPlorer for all the things I do. Guess I am missing lots of other uses... Not even sure what scripting is used for. Is that anything like macros?? doh. Ste Fan Not even sure what scripting is used for. With scripting you can automate your work by doing several things with one click. And you can build your own commands. You don't have to wait till the developer will do that for you. Or you can call other applications or command line utilities that do something with files you have selected. See, If you have to do every day the same, you can wrote an script that does this for you. Writing an script is easy, there is an help file and an forum with many advanced users to aid you. One could call this 'macro' too, but with much more power if you need them. If not, you can do simple things at easy with a few commands only. Yes! There is no DualPanel feature (one folder on the left, one on the right) right now. But WinExplorer has no DP either and this last for the most of the Windows users. the time it saves me is more worth then $15! Ste Fan And with EURO it's even 10 _ only. Wenn Sie in EURO bezahlen sind es sogar nur 10 Euro statt 15 Dollar. XYplorer ist ein Werkzeug um seine Datei effektiv zu verwalten. Dies kann man etwas umständlicher auch mit dem WindowsExplorer erledigen, jedoch bietet XY viel mehr Möglichkeiten um sich die Arbeit zu erleichtern. - XYplorer muss nicht installiert werden, somit ist diese Anwendung voll portable und kann auf einem USB-Stick mitgenommen werden. - XY bietet TABs wie z.B. der neue InternetExplorer oder Firefox. Somit kann man mehrere Ordner gleichzeitig geöffnet haben und schnell hin-und her wechseln. - eine Zwei-Fenster Ansicht (ein Ordner links, einer rechts) ist für später geplant, diese Lizenz wird auch für diese Version (8.0 ?) gültig sein. welche Sie für immer benutzen können, sie läuft nie ab. - XY beinhaltet eine sehr gute Datei Suchfunktion. - Ein Renamer zum umbenennen vieler Dateien auf einen Schlag ist auch dabei. - Sie können sich prima Bilder und Text in einer Vorschau ansehen. - Sie können sich eigene Kommandos anlegen um Ihren Arbeitsablauf zu beschleunigen. - Für komplexe Aktionen können Sie eine umfangreiche Skriptsprache einsetzen oder sich im Forum beraten lassen. - Die Dateiansicht kann gefiltert werden, sodass Sie nur dass sehen was Ihnen wichtig ist. "XY-plorer" (EksWai-plorer) oder "Zaiplorer", ganz wie Sie möchten. Rich Lang I assume we can assign a color to folders? Most importantly, to me, is the dual pane view for drag and drop. When (what date, not what version) will that be available? 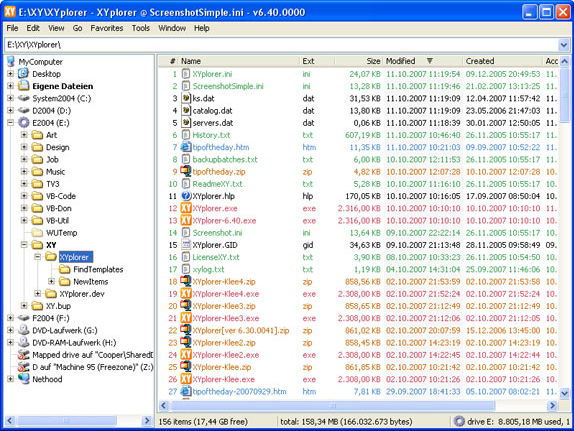 Stephen Cohen Can the search engine in XYPlorer search for text in .zip and .mht files? Assign a color to folders: Yes. Folder Icon: Using scripting you can automate the standard way using desktop.ini pointing to an icon. Dual Pane: I would not recommend to make a purchase based on a promised future feature. You really should download the trial and see if it works for you as it is now. That said, I would be surprised if XY wouldn't have dual pane by March 09. Search for text in .zip and .mht files: A binary search yes, but not a search in the uncompressed contents. Rich Lang I just ordered. Looks very useful. Lots of ways to mark folders. There is one need I forgot to ask about. I need to be able to use this on my desktop when at home and my laptop when I travel. I assume I can do this with the copy I purchased? Is there a way to transfer the file attributes I have built on my desktop to my laptop? The license is good for any number of machines. It's per user. The "Backup (To)" operations will copy files with all attributes. Please consult the user forum for further questions. Stephen Cohen I asked if XYplorer could search for text in .zip and .mht files. "Search for text in .zip and .mht files: A binary search yes, but not a search in the uncompressed contents." I don't know what this means. A binary search, but not a text search? And no search in UNcompressed files? STE Fan See, an archive is an binary. temporally and get them back later by un-packing. and so you can search this archive and find something. but for size reducing also.... you will find less results. Maybe you could suggest this feature at the forum? Donald Lessau I meant: XYplorer will search any file's contents (binary or text) for any binary or textual data. But it will not first decompress zip archives and then search the decompressed contents. STE Fan Thanks for that great deal ! The soft works wonderful ! I order even for the full price an second license right now. That soft is fully worth this. Donald Lessau XYplorer 8.00, the Dual Pane Edition, will be officially released on Monday, 15-June-2009. Sync, Compare, Edit, and Merge Files -- Intuitively and Gracefully!